Luke and I received t-shirts when we signed up to play a beach volleyball tournament. The shirts had illustrations of a Hokusai-like wave and an octopus. After a day playing a volleyball tournament in strong winds at Point Pleasant Beach, I stepped into the shower to remove my sandy clothes and then called to Chiara, whom I was going to rinse off in the shower, too. She was sandy, grimy, sticky and sweaty–direly in need of a shower. But she backed away from my outstretched arms and said, Noooooo! I’m clean! I’m clean! Last night was the worst! Miss Munchkin was NOT going to go to sleep. I asked nicely: Please help Oma tonight and go to sleep. I got bossy: Go to sleep! Now. I was determined: Each time Chiara opened the door of her bedroom, I picked her up and wordlessly put her back to bed, just like Supernanny says to do. But all I got in return was attitude. Crying, kicking, screaming. She refused to lie down. Would only stand up and sidle up next to my leg. After a dramatic tantrum, I held her in my arms until she drifted off to sleep. But as I leaned down to put her on her bed, she woke up and made her back rigid and immediately turned over, climbed off the bed and stood next to me, crying, No No No! So I picked her up and she fell asleep again, and then I put her back on the bed and this time managed to get out the door. But, a few moments later, there was Chiara, standing next to my stool at the breakfast bar, where I was taking a break and reading. I had had it! I was so tired myself but I had to pack for our trip to Washington DC, clear out whatever would go bad in the refrigerator, and then and only then go to sleep. So I finally decided that I would turn out all the lights in the entire apartment and wait her out, and hopefully, not fall asleep myself. So, I turned out all the lights. Chiara was silent. Next thing I know, she was lying on the hardwood floor in the middle of the living room, about two feet from my stool, sleeping. Wow. Then the phone rang so I went to the bedroom and talked for a few minutes with my brother. When I hung up, I trained my eyes on the living room floor where Chiara had been sleeping but I couldn’t make her out even though she was wearing a light blue onesie to bed. I carefully made my way to the living room, picking my steps carefully in case she had rolled somewhere else. But no Chiara. No Chiara in her bedroom either. No Chiara in the kitchen. Hmmm. I stopped and listened and I could hear her breathing. She was sleeping somewhere…. I found her on the living room couch. Asleep with her head resting on one of the pillows. So cute! I picked her up and carried her to her bed. Finally! Sleep is conquered! Of course, it only lasted three hours. Oh well! This is munchkin at 16 months, seven months ago! 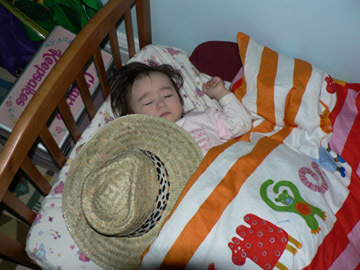 That night, she stubbornly insisted on wearing her cowboy hat, even to bed.